Over the past 13 seasons (since 2000), it seems that about half of the National Football League teams end the season with a 1,000-yard runner. The 2012 NFL season was no different. Last season, 16 teams had a 1,000-yard rusher. The 16 1,000-yard rushers was the third lowest number since 1999 when 14 runners gained 1,000 or more yards rushing. Most 1,000-yard rushers since 2000? In 2006 there were 23. 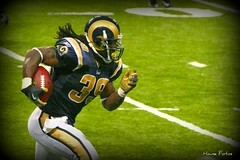 The St. Louis Rams, led by Steven Jackson, lead the NFL with eight straight seasons with a 1,000-yard rusher. The Tennessee Titans have a streak of seven straight seasons, with Chris Johnson reaching that mark in the past five seasons and a pair of runners accomplishing that mark in two previous years. A pair of teams last season had their first 1,000-yard rusher in a couple of years; the Washington Redskins had a 1,000-yard rusher in rookie Alfred Morris, the first runner to reach that mark for the Redskins in a season since Clinton Portis did it in 2008. The Buffalo Bills in 2012 had a 1,000-yard rusher in C.J. Spilller; the last Bills runner to accomplish that feat was Fred Jackson in 2009. Following are the NFL teams that have had a 1,000-yard rusher for three or more consecutive seasons (active). At the other end of the spectrum are the six teams that have not had a 1,000-yard rusher in the past three seasons… and beyond. The Detroit Lions top this category; they have not had a 1,000-yard runner since 2004. Following are the teams that have the longest current drought of 1,000-yard rushers.